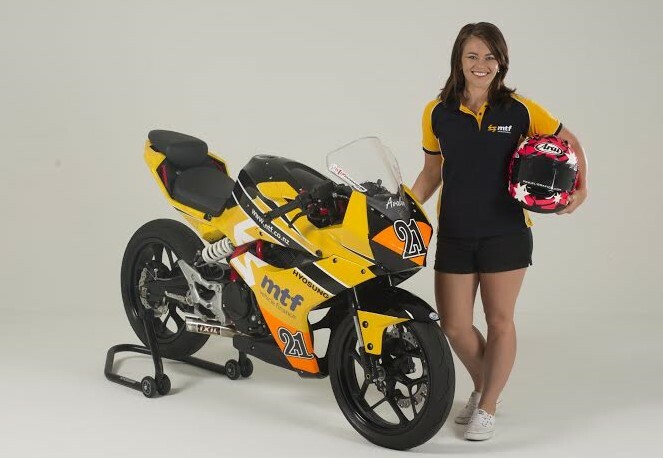 After a successful season retaining her FIM European Womens Cup title, flying kiwi female Avalon Biddle has returned home and is preparing for another summer of motorcycle road racing. With support from MTF Vehicle Finance, Biddle will race a Kawasaki ZX6r prepared by Chris Osborne of Feilding in the 2017 NZSBK season. The Supersport 600cc field is heating up with majority of the front runners from 2016 returning, and more riders stepping back from Superbike for a crack at the 600cc title including 2013 European Junior Cup winner Jake Lewis. Biddle knows she has her work cut out for her but feels this season’s racing in Europe has given her a little edge over the competition. A company all about getting people up and running in times of need, MTF backed Avalon to race in the WIL Sport European Junior Cup this year in a perfect match to get her on her wheels up in Europe. In a crusade to support outstanding individuals in Motorsport, MTF have also paired up with Albany girl racer Chelsea Herbert who will be debuting in the New Zealand Touring Car Championship. These two females wont be missed in/on their bright yellow vehicles tearing up the New Zealand race tracks. ”I look forward to engaging with the fans of Motorsport in NZ & together with MTF we have some big activities planned for the public. It’s going to be another busy, fast-paced summer that we are all really looking forward to! ” Says Biddle from her home in Orewa, north of Auckland. Biddle is also supported by Spectrum Motorcycles, Kawasaki NZ, RaceSupplies NZ, Pirelli, Formula Fit High Performance Centre, Rynopower, RST racewear, Motul, Sidi boots, Carl Cox Motorsport Hyosung Cup, Auckland Motorcycle Club, WIL Sport, Deepweb Web Design & NGK Spark Plugs Australia. Testing will begin late this year in the opening two rounds of the Suzuki Series and Avalon will also be on track on her Spectrum Motorcycles/MTF Hyosung X4R in the Carl Cox Motorsport Hyosung Cup throughout the NZ summer season. See more at www.mtf.co.nz, www.avalonbiddle.com & www.mnz.co.nz for series results. ← Avalon wins 2016 FIM European Women’s Cup!